Members check out some great stories from different club members who went out on a fun automobile adventure. Click on the links below. When Larry Arrowood called me to see if I wanted to go for a ride to Burwood for lunch and get an old style sandwich, I jumped at the chance. And what a ride Southwest of Downtown Franklin, Tennessee on Carters Creek Pike. 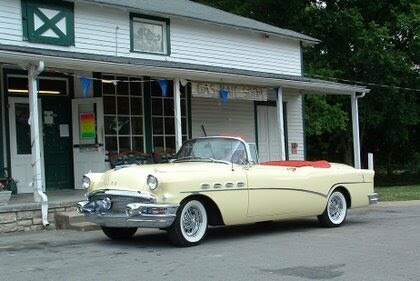 We drove in style with Larry’s 1956 Buick Roadmaster. Larry’s Buick is as good as it gets for a 15 mile summer afternoon cruise to a grocery store that has been in business since 1910. So with the top down and the wind in our hair and the original radio broadcasting tunes from the 1950’s I was having the time of my life enjoying the green rolling hills that Williamson County has to offer. When we pulled into Burwood the first thing you hit on the left hand side of the road is Huff’s Store. It’s kind of like old meets new. The original store from 1910 now has new gas pumps outside for everyday convenience. Across the street there is a neat old filling station with a pump still standing, but is fully enjoying retirement. Once inside you’re taken back to an era gone by. The store is full of every day products and has a nice sliding step ladder to reach the high stuff. Now for the good part the sandwich. You place your order on a small index card and with no time at all your greeted by a four inch sandwich. There are plenty of benches to sit on for enjoying your lunch. I was not able to finish this gigantic sandwich and did not even consider a bite of dinner after this meal. So if you go bring your appetite and your camera for some great pictures. So load the car up and take a trip down memory lane in Burwood Tennessee.